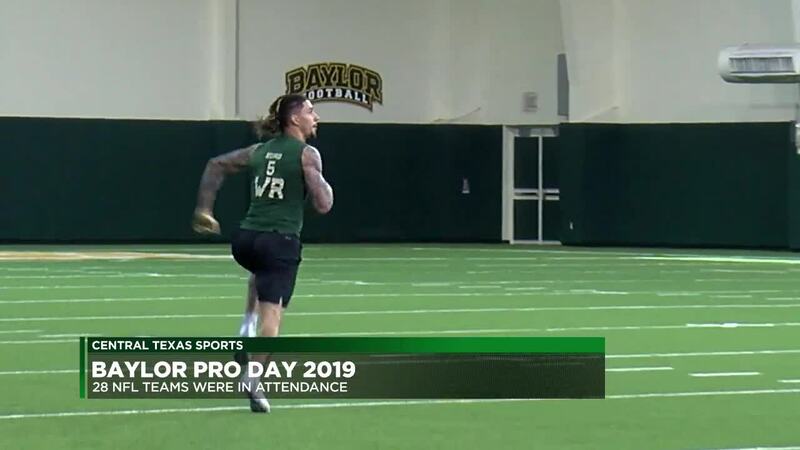 WACO, TX — Collegiate football players dream of the day they'll have a chance to prove to NFL scouts they belong in the league, and Tuesday was that day for several Baylor seniors. "They've worked hard to have a chance to be here. They deserve to be here, so it was fun to see them go out there and chase their dream," Baylor Head Coach Matt Rhule said. Twenty-eight NFL teams came to check out Baylor's athletes. Black Blackmar led the Bears in the bench press with 32 reps.
Jalan McClendon chose to participate in NC State's pro day last week, but he did throw Tuesday at Baylor. Jalen Hurd, still recovering from a knee injury that kept him out of the Texas Bowl in December, caught a few balls and participated in the running tests. He posted an unofficial 4.66 for his 40. Hurd, a wide receiver, and Derreck Thomas, a corner back, also participated in the NFL Combine back in March. "It's been great. Honestly, I've been waiting for it for my entire life, so it's been amazing to come out here and do this and be a part of it and show everything I've got," Hurd said. "I don't really pay attention to the where you're gonna go thing because no one really knows, and at the end of the day, it doesn't matter. The only thing that matters is that you get in there, and once you get in there, you do what you're supposed to do," Thomas said. Galitz and Lawerence are recovering from surgery, so they were only measured at Pro Day.